The Republic of Lithuania is a country in Northern Europe, the largest of the three Baltic states. It is situated along the southeastern shore of the Baltic Sea, to the east of Sweden and Denmark. It borders Latvia to the north, Belarus to the east and south, Poland to the south, and a Russian exclave (Kaliningrad Oblast) to the southwest. 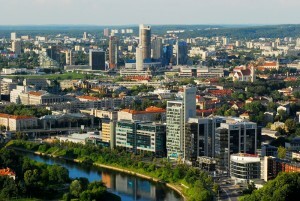 Lithuania has an estimated population of 3 million as of 2012, and its capital and largest city is Vilnius. The Lithuanians are a Baltic people, and the official language, Lithuanian, is one of only two living languages (together with Latvian) in the Baltic branch of the Indo-European language family. For centuries, the southeastern shore of the Baltic Sea was inhabited by various Baltic tribes. In the 1230s the Lithuanian lands were united by Mindaugas, who was crowned as King of the Grand Duchy of Lithuania, the first Lithuanian state, on 6 July 1253. During the 14th century, the Grand Duchy of Lithuania was the largest country in Europe: present-day Belarus, Ukraine, and parts of Poland and Russia were territories of the Grand Duchy of Lithuania. With the Lublin Union of 1569, Lithuania and Poland formed a voluntary two-state union, the Polish–Lithuanian Commonwealth. The Commonwealth lasted more than two centuries, until neighboring countries systematically dismantled it from 1772 to 1795, with the Russian Empire annexing most of Lithuania’s territory. In the aftermath of World War I, Lithuania’s Act of Independence was signed on 16 February 1918, declaring the re-establishment of a sovereign state. Starting in 1940, Lithuania was occupied first by the Soviet Union and then by Nazi Germany. As World War II neared its end in 1944 and the Germans retreated, the Soviet Union reoccupied Lithuania. On 11 March 1990, the year before the break-up of the Soviet Union, Lithuania became the first Soviet republic to declare independence. Prior to the global financial crisis of 2007–2010, Lithuania had one of the fastest growing economies in the European Union. Lithuania is a member of NATO, the Council of Europe, and the European Union. Lithuania is also a full member of the Schengen Agreement. The United Nations Human Development Index lists Lithuania as a “Very High Human Development” country. Vilnius is the capital of Lithuania, and its largest city, with a population of 554,060 (838,852 together with Vilnius County) as of 2011.It is located in the southeast of the country. It is the second biggest city of the Baltic states, afterRiga. Vilnius is the seat of the Vilnius city municipality and of the Vilnius district municipality. It is also the capital of Vilnius County. The first known written record of Vilnius as the Lithuanian capital is known from Gediminas‘ letters in 1323. Vilnius is classified as a Gamma global city according to GaWC studies, and is known for its Old Town of beautiful architecture, declared a UNESCO World Heritage Site in 1994. Its Jewish influence until the 20th century has led to it being described as the “Jerusalem of Lita” and Napoleon named it “the Jerusalem of the North” as he was passing through in 1812. In the year 2009, Vilnius was the European Capital of Culture, together with the Austrian city of Linz.